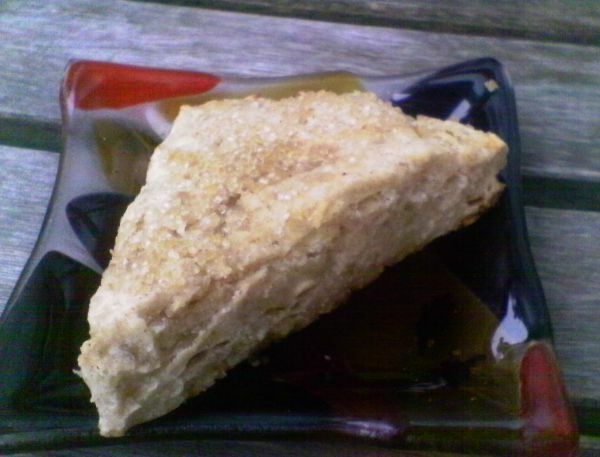 Here's a recipe for really tasty apple scones. Perfect with a cup of tea or tucked into a lunch box as a surprise treat, these scones are quick and easy to whip up. In a large bowl, whisk together flour, xanthan gum, baking powder, 3 tablespoons sugar, cinnamon, nutmeg and salt. Using a pastry cutter, mix in cold Earth Balance until batter looks kind of like peas. Shape dough into a disk measuring approximately 7 inches across. Cut the dough disk into 8 triangles. Separate triangles and distribute on baking sheet . Bake 12-15 minutes, until firm and lightly golden. No corn either!!! (if you use Hain baking powder) Lumping awesome! I was looking for something to bring to a party this weekend and these look like the ticket. Thank you! guar gum...gotta use guar gum too. Man, I hate being allergic to gluten and corn! I am going to experiment on whole-food binders (like chia seeds), I just keep getting overwhelmed by life :) With your comments, I am re-motivated! You can also try using gluten-free oat flour in place of the all-purpose flour and xanthan gum, since oat flour doesn't need a binder. The texture will be different, but the combination of apples and oats is always a winner (if you can tolerate oats, that is). Thank you, thank you, thank you!! Just pulled these out of the oven and they are so delicious! And perfect! Thanks for giving me another go-to, gluten free recipe! These look good! I look forward to trying them. I have used coconut oil in these, too. That's a great idea to use the coconut palm sugar. I'll give it a try! These are gorgeous. I can't wait to try! My kids will love them. Thanks, Amber (and all the rest of the AFW hostesses)!